When an iOS device is configured with an Office 365 Exchange account, the sync relationship is between the iOS device and the Exchange server. Your iOS device is not being synced with your computer, and that's the way you want it to stay. If you change your configuration to enable syncing, you run the risk of completely losing the calendar data in your Exchange account, losing it in a way that it cannot be recovered. iTunes has a feature you DO NOT want to enable, which allows you to sync calendars on your computer to your iOS device. This feature is intended for calendars that are local to the computer only, not for calendars that live in cloud services (such as Office365, iCloud, and Google Calendar). This iTunes feature is NOT enabled by default, and you should leave it that way: not enabled. Here's how to check your settings and correct them if necessary. With your iOS device NOT connected to your computer, open iTunes. 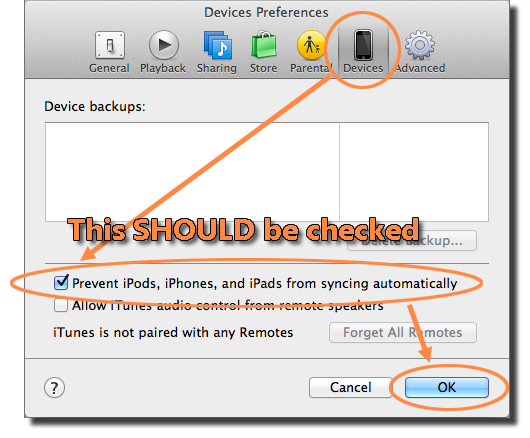 Make sure Prevent iPods, iPhones, and iPads from syncing automatically IS checked as shown here. Select your iPhone (or iPad) in the iTunes interface. 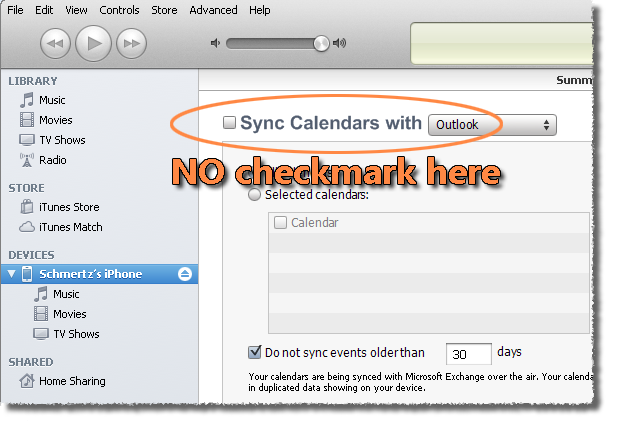 Make sure that Sync Calendars or Sync Calendars with (exact wording depends on your version of iTunes) is NOT checked as shown here. If you see the message shown here, click Keep Calendars. If you connect to your Exchange account from more than one iOS device, repeat steps 6 - 11 for each device.